He has been expected for generations by all of the major religions. Christians know him as the false prophet, and expect him to imitate the miracles of jesus. Hindus look for him to manifest as the Krishna; Buddhists expect him as Maitreya Buddha; and Muslims anticipate the Imam Mahdi or Messiah. Preferring to be known simply as the Teacher, Maitreya will come as a religious leader, to found a new religion and guide people of every religion and those of no religion. At a time of great political, economic and social crisis Maitreya will rise to power and inspire humanity to see itself as one family, and create a economic and global new world order. He will launch a call to action that will proclaim that only man can solve mans problems and the need for a supreme God is u necessary. Among Maitreya's recommendations will be a shift towards socialist priorities so that it will appear that adequate food, housing, clothing, education, and medical care become universal rights. Ultimately this will be a complete fraud and his real agenda of a one world economic system will be implemented. Under Maitreya's delusion, humanity itself will become enslaved by the very ideals that were supposed to make a saner and more just world for all. How will the False prophet make his presence known? In recent years, information about Maitreya's emergence has come primarily from Benjamin Creme, a British artist and author who has been speaking and writing about this event since 1974. According to Creme, Maitreya descended in July 1977 from His ancient retreat in the Himalayas and took up residence in the Indian-Pakistani community of London. He has been living and working there, seemingly as an ordinary man, His true status known to relatively few. He has been emerging gradually into full public view so as not to infringe humanity's free will. As a modern man concerned with today's problems, Maitreya has worked on many levels since 1977 to prepare humanity for His outward presence. From behind the scenes, the outpouring of His extraordinary energy has been the stimulus for dramatic changes on many fronts, including the fall of communism in the Soviet Union, the collapse of apartheid in South Africa, the rapprochement between East and West, the growing power of the people's voice, and a worldwide focus on preserving the environment. Outwardly, He has met with groups of journalists and influential leaders from all fields, informing them of His solutions to today's most pressing problems and of the role they might play in the coming time. Since 1988 Maitreya has appeared miraculously throughout the world, mainly to orthodox religious groups, presenting in the simplest terms the great spiritual laws governing our lives. And, through steadily increasing signs and spiritual manifestations, now widely reported in the media, He has touched the hearts of millions, preparing them for His imminent appearance. At the earliest possible moment, Maitreya will demonstrate His true identity. On the Day of Declaration, the international television networks will be linked together, and Maitreya will be invited to speak to the world. We will see His face on television, but each of us will hear His words telepathically in our own language as Maitreya simultaneously impresses the minds of all humanity. Even those who are not watching Him on television will have this experience. At the same time, hundreds of thousands of spontaneous healings will take place throughout the world. In this way we will know that this man is truly the World Teacher for all humanity. What is a Master of the Wisdom? The Masters of the Wisdom are a group of perfected individuals who have lived behind the scenes in the mountains and deserts of the world for countless millennia, guiding and overseeing humanity's evolution. They are now in the process of emerging into the outward everyday world for the first time in many thousands of years. At their head is Maitreya, the Master of all the Masters, who is now living among us. Masters of Wisdom -- Individuals who have taken the 5th initiation, having passed through all the experiences that life in this world offers and, in the process, having acquired total mastery over themselves and the laws of nature. Custodians of the Plan of Evolution and all the energies entering this planet which bring about the fulfillment of the Plan. Initiation -- A voluntary process whereby successive and graded stages of unification and at-one-ment take place between the man or woman in incarnation, his/her soul, and the divine Monad or spark of God. Each stage confers on the initiate a deeper understanding of the meaning and purpose of God's Plan, a fuller awareness of his/her part in that Plan, and an increasing ability to work consciously and intelligently towards its fulfillment. Born again believers know this "initiation" is demon possession. 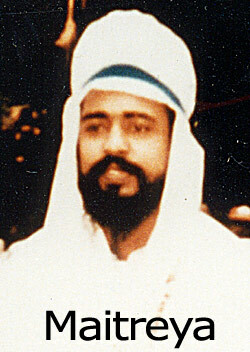 Benjamin Creme, a British artist and long-time student of occult philosophy, has become the principal source of information about the emergence of Maitreya, the False Prophet.